A while back, I wrote in the blog post ArchiMate is overrated (and underrated) that using ArchiMate doesn’t really have that much added value for communicating simple, high-level views to stakeholders (users, management), but its structure does bring advantages that enables us to model large (detailed) landscapes. Such models have an essential advantage when they are modelled not just graphically, but in a real ArchiMate modelling environment: it opens the Business-IT landscape for useful analysis. But, to be practically able to do analysis, there are limits to our freedom of modelling. Analysis in ArchiMate models is probably always ‘dependency analysis’. On which applications does this business process depend? What infrastructure supports this critical application? How are certain requirements, such as those from risk and security realised? Such insight is highly valued in organisations, given the fact that in complex landscapes, this lack of insight results in uncertainty and risk. Comparing enterprise architecture to a game of chess (something I regularly do, see Chess and the Art of Enterprise Architecture): if much of the situation on the enterprise chess board is hidden from you, it becomes more difficult to make good moves. There are two possible models of analysis of a model. One is ‘by hand’. A human looks at the model and investigates, walking through the model to investigate dependencies. You pick an element in a view and you ask the model “what is attached to this element?” and so you build up an answer to a question you have. Because humans are intelligent, and can interpret models as they go along, this option works in minimal circumstances. If the modellers did not use fixed patterns, and they actually understood ArchiMate enough to use the correct relations, you can get an answer to your question. But such manual analysis is slow and expensive, and — as humans are not machines — error-prone. The ideal situation therefore is to have automatic analysis, generally called `reports’. 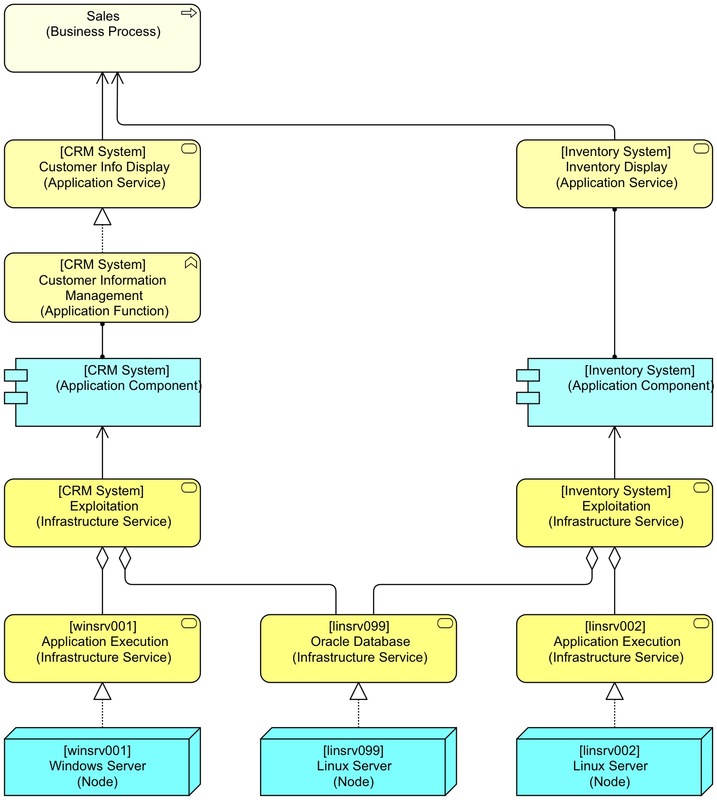 To create reports from models, such as the answers to “give me all applications that support this critical process for which the regulator has just announced new requirements” you need a model that can support analysis, and just using the syntax of ArchiMate is not enough. What you see here is a fundamental tradeoff in modelling: for every variation in patterns you get in your model, your analysis will get more complicated with an extra route to follow. This is why it pays to have as little as variation as possible in your modelling patterns, that is, if you want to use your model for reporting. And it is also important that your different patterns do not complicate analysis routes. So, for instance, you might Assign a Role to a Business Process when it performs the process, but when you want to model the process owner as well, you do not use assign-to again, but use Association so you have different patterns for different meanings. The left hand side is ambiguous under analysis, we might want to follow the route from function to the performer, but not to the owner. Using a different relation, makes automated analysis possible (shown at the right hand side). This option is not always available, but can be used. Note: this example is not the best as ArchiMate s quite clear that Assign-To means ‘performs’ and not ‘owns’. See also Section 12 Secondary and Tertiary Architecture in the book. But for instance, we Associate the application manager with the Application Function and the application owner with the Application Service. If we would not have the application function and we would Associate both with the Application Service, we would be unable to tell application owner and application managers apart. This is one of the reasons to have that extra element, the Application Function, in our models. You can also work with properties of elements and relations, but that is not easily visible nor easily usable in ad hoc analysis, so I prefer actual structure above properties. And the one thing I never use for discrimination in analysis is the textual label. The label is unstructured information and not to be used for analysis. When you choose your modelling patterns, you need to think about the (unknown) future. If you change your pattern, you need to update the entire model before you go on adding to it. The problem of course is that such a model can answer only one question. The power of a good model is that it can be used to answer many questions, including many that haven’t been asked yet. Designing that is hard. Luckily, using it is pretty easy. And you hardly ever communicate the views of the model itself to the stakeholders. But the reports are easy to understand and very valuable. 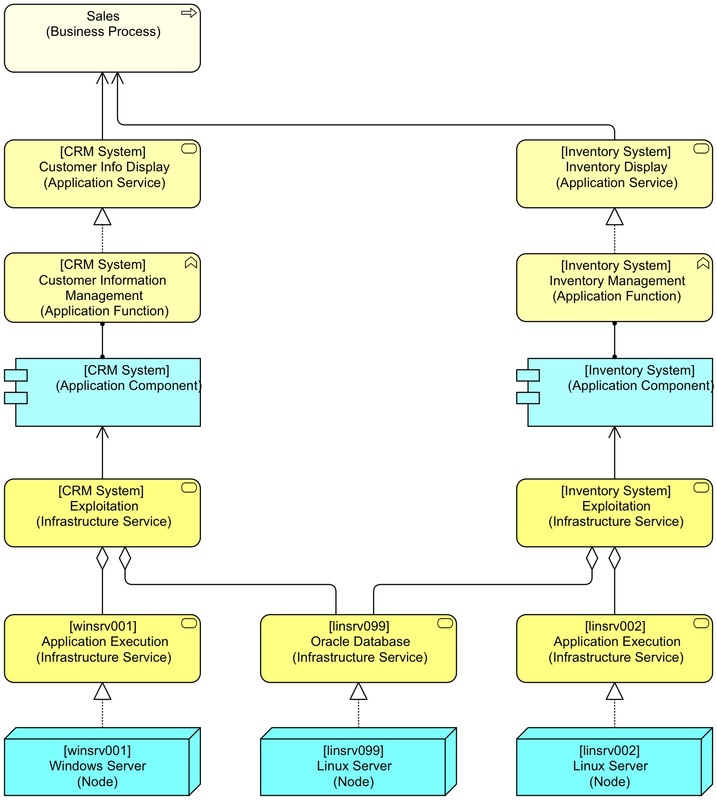 And even with an extensive detailed setup as in the first diagram above, the simple report can be generated. Visually, if must be, in the form of the last diagram. Basically: leaving detail out when you are reporting is possible, ‘inventing’ it is not. Blimey! I did not digress! Previous Entry:Losing a Limpet – What happens when we don’t have Enterprise Architecture? Slight digression on that topic: I very often see imperative programming and from time to time graph based languages (e.g. Cypher for Neo4j), But one should not forget declarative programming, and in particular logic programming like prolog. I used to work on a kind of impact analysis engine for ArchiMate and I were able to walk through relations (and particularly derived ones) in less than 10 lines of code. I am also interested in analyzing Archimate with the help of declarative programming. Could you, please, share some information about it? How queries to the model designed? Well, that depends of course on the tool you use. Some tools (such as BiZZdesign Architect and its successor BiZZdesign Enterprise Studio, or Sparx Enterprise Architect) come with embedded languages that can access the model and produce all kinds of output. I only have experience with BiZZdesign’s embedded language. Here is a snippet with a function that finds all objects without relations. Sorry, formatting gets lost in the comment.